Your furniture is one of the most important facets of your interior décor. If your furniture is becoming outdated or unattractive, it can take away	from the rest of your homes style. Fortunately, removing all of your old	furniture is not the only solution. Call the professionals at Discount	Fabrics and have us show you our amazing selection of furniture upholstery	fabrics. With over 40 years of experience, we know exactly how to provide	San Francisco & Berkeley residents with the right fabrics to reupholster	their furniture and make their interiors more elegant. If you’re unsatisfied with your furniture upholstery for any reason,	you should consider having it replaced. Here are a few common reasons	why people get their furniture reupholstered. Moving Accidents: A lot can go wrong during the moving process. If your furniture’s upholstery	gets snagged and torn while moving, you may need to invest in new fabric. Food/Animal Stains: If you allow people to enjoy foods and beverages on your living room furniture,	there’s a good chance you’ll end up with an irremovable stain. The same goes for pets. Sunlight: Your furniture’s fabric will fade after prolonged exposure to the sun’s	rays. Eventually, the fabric will become so faded that you’ll need	to get it replaced. Once you decide to reupholster your furniture, you’ll face two choices:	choose a similar fabric or opt for a completely different fabric. Here	are a few popular furniture upholstery materials from Discount Fabrics. Leather: Leather is elegant, comfortable, and durable. You might also try faux leather	if you’re looking to save a little money. Chenille: Chenille is a soft, warm fabric that is excellent for chairs and sofas. However, it’s not a great choice for pet owners. Cats are especially	fond of scratching chenille. Velvet: Velvet is a famously luxurious fabric that can complement any upscale décor. Velvet is also soft and welcoming to the touch. Brocade: Brocade fabric typically has a raised design over a flat background. Brocade	is excellent for style, but not as comfortable as other fabrics. Vinyl: Vinyl is popular because it’s durable and easy to keep clean. Most	vinyls are also relatively inexpensive. 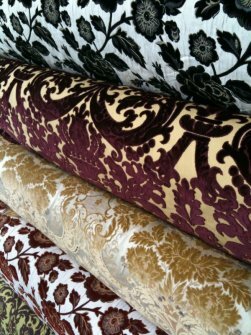 For more information about furniture upholstery fabrics in general or the	above fabrics in particular, call Discount Fabrics at (415) 495-4201. We have fabrics stores in San Francisco and Berkeley, and our fabric experts	are always standing by to help you make perfect choice.